So for those of you who know me well you know that I am a scheduler. I like routines and lists and utilize the principle of "planned spontaneity" liberally. It seems like I have gotten better as I have gotten older but it's probably because I am oblivious to my own ways. I talked to my boss at the beginning of November and made sure it was fine for me to be gone for what will end up being 25 days of work. An avid traveler himself, he answered by getting out some travel books and showing me the Madagascar entries, thanks David! 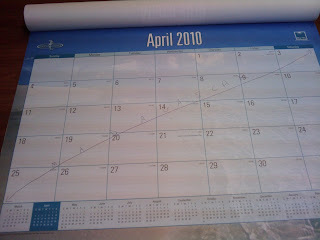 I just bought a 2010 calendar for my office the other day and was writing in work trips, conferences and deadlines. I took great pleasure in filling out April's page. I then realized I had a dentist appointment scheduled for March 31st and called to reschedule right away because some habits, like proper dental hygiene, are important not to break. This is why you fit in so well with the McGoldrick side of the family. Planning is one third the thrill of the trip....enjoy!